The Miss Chinese International Pageant 2017 was successful held on Sunday, January 16 at the Arena of Stars in Genting Highlands of Pahang, Malaysia. This year, 16 candidates from 11 countries around the world competed for the crown, making it a night of multicultural pride. In one talented icy sweep, #12 Stich Yu (余思霆) from New York City, United States won the crown, followed by #5 Serene Lim (林宣妤) from Kuala Lumpur, Malaysia as the first runner-up. 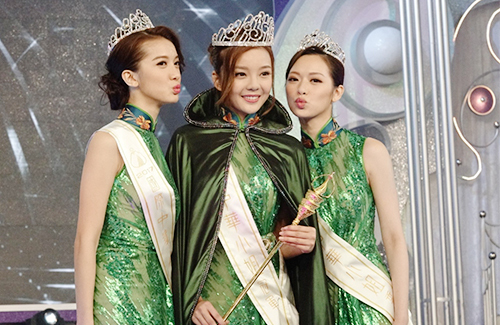 2016 Miss Hong Kong winner, #3 Crystal Fung (馮盈盈), was the second runner-up. Just as the arena was in agreement that Serene would be the night’s big winner, Stitch Yu dropped a surprising move on the judges when she chose to do inline figure skating as her talent performance. The odds turned to her favor after Stitch successfully completed 20 spins and a beautiful split during her jaw-dropping performance. When Stitch’s name was announced for the crown, the 22-year-old Taiwanese American bursted into tears. Though Stitch had faced rumors of plastic surgery during her time competing for the pageant, she remained calm and confident during her performances. Serene was praised for her charisma and quick-wit, while Crystal clinched third place due to her popularity and likable personality. #4 Addy Li (李虹臻) from Johannesburg, South Africa won Miss Friendship and #15 Gloria Li (李珮儀) from Toronto Canada won Miss Finesse. Supported by her home country, runner-up Serene Lim also won the Malaysian Charm Award. Although she wasn’t my personal choice for the winner, she still has her own supporters that are very happy for her and I respect that. Also, I agree with the people who say Serene Lim is prettier. Haven’t watched the pageant yet though. This is based on looks only. She has brought silly naming to a whole new level.Well done! I have just added her name to my repertoire of “curse words” that I can use online without impunity. LOL!! !